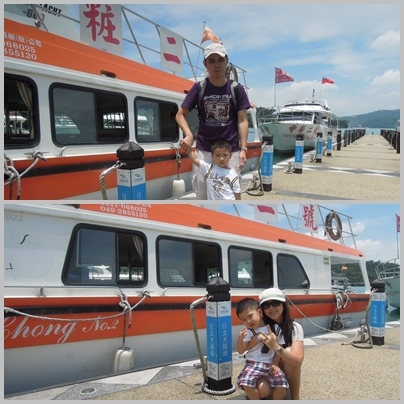 To go to Sun Moon Lake (SML), we'll have to take Nantou bus from Taichung HSR Station cost us NT190 per adult. Take Exit 5, Platform 3 from the station, and you'll be able to buy DIRECT bus ticket to Sun Moon Lake (no transfer required at Puli). For the bus schedule, refer here. There are bus on hourly basis. It was comfortable although IZ was sitting our laps, he could fall asleep too. 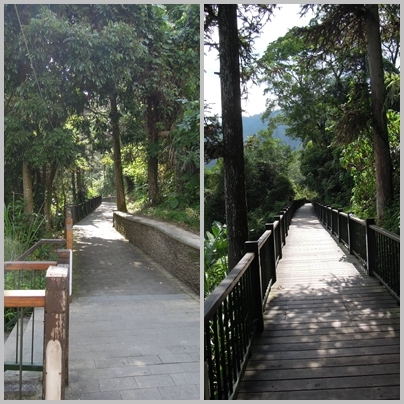 The bus would route to Chia Nan University which is high above on a mountain (how cool it is to study there? ), before making its way to SML. The entire journey took us an hour. We were expecting an hour and 20minutes. 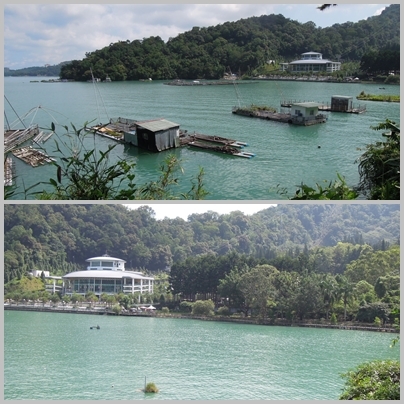 I felt something was wrong somehow, and when hubby checked with the driver, we had arrived at SML! ﻿I didn't know where the pier was and so I called the owner of Cherng Yuan Hotel where we'll put up for the night. As I was told it was easier to take a boat to Itathao where the hotel was situated, we went to the counter to buy boat tickets. To be told the boat was about to depart! We had to run to chase after the boat.. the thing was.. the pier was quite a distance away (though still walking distance). I had no chance to see see look look Shueishu at all. Boo! She should have given us the next boat ride so that we could sightsee a little, I didn't even had the time to take ONE photo. Boo boo! It pissed us even further later on, as we get to know from hotel, that there were actually multiple ride tickets available! The counter didn't tell us about it, and sold us One Way Ticket, so we decided it would be too costly to buy more tickets just to further wobble our legs. Didn't look like I was on the go eh? As check-in time was 3pm, we were a bit early. 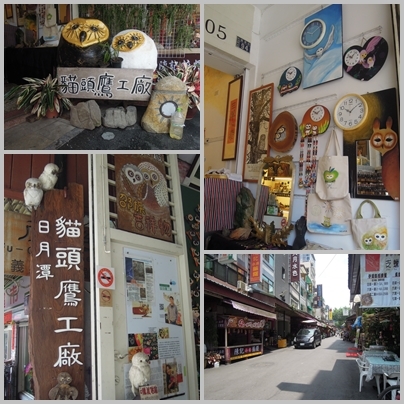 We checked-in Cherng Yuan hotel (click on the link for review and photos) to drop our luggage to wander around Itathao which has only 3 streets overall. It was a very quiet place. There was no tourist in the streets, every restaurants were so quiet. We were surprised actually. So we thought it would be livelier at night. Boy, we were so wrong. 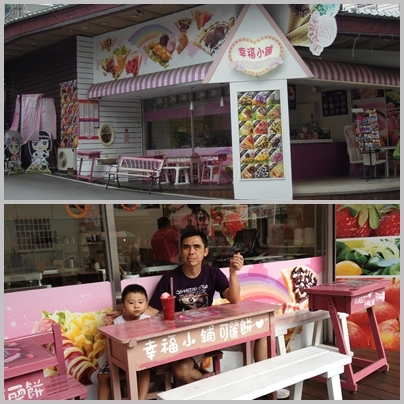 We saw 2 people bought BBT from this stall. Although there was picture of celebrities, we had our reservation. And we thought to patronise at night.. gosh.. they were closed! :-( And the next day, when our car passed by the stall, there was horrendously long Q..
We decided to check Si En Pagoda out but the bus was so rare, we had to wait up to an hour, for a bus that we missed by 10 seconds. If only we walked slightly faster.. but then, things happened for a reason. We were told the next day that Si En Pagoda was closed as there was risk after the recent earthquake. So we thought evening would be livelier? How else to have relaxing life eh? The next morning after breakfast in the hotel, we decided to give cable car a try. We didn't manage to take the day before as it was closed for maintenance. Suggest whoever going there to check on their maintenance schedule otherwise you'll be making a fruitless trip to SML. Was disappointed as the 3D was in Japanese while subtitles were in Chinese.. I don't understand a single thing! I know I would sound stupid to choose the last one, but anyway I've learnt since.